Place about the size of a cherry of clay wash in wet hands. Gently rub hands together. ※No need to lather. Lightly massage Clay Wash over entire face to gently remove dirt. Please do not rub or scrub too harshly. Carefully rinse with lukewarm water. Please be certain that there is no white cream residue left on skin by washing face clean. ※ If Clay Wash accidentally gets into eyes, please rinse with lukewarm water. If pain and inflammation occurs, please consult your ophthalmologist. Place about 2 cm diameter size of C serum in the palm of hand. Spread lightly on both hands and then gently wrap entire face with hands, letting the serum absorb into skin. In delicate areas of the face such as around eyes, mouth, and nose, gently press and massage serum into skin using middle and ring fingers. Finally, wrap face with hands by placing palms of each hand over entire face until the palms sticks to the skin. Then gently press serum into face. ※ If you use C serum during the daytime, please use in conjunction with a product with UV protection, such as sunscreen. ※ For dry skin and/or sensitive skin, please test and observe condition first in small amounts on skin. Place about a 1-2 pearl size of QuSome White Cream 1.9 in the palm of hand. Place the White Cream on five points around the face: forehead, chin, both cheeks and nose. Using palms of hands, smooth White Cream from inside face near nose outwards circling around eye area. Finally, wrap face with hands by placing palms of each hand over entire face until the palms sticks to the skin. Then gently press cream into face. ※ Please use QuSome White Cream 1.9 only at night. Place about a 1-2 pearl size of Rich Cream in the palm of hand. Place the Rich Cream on five points around the face: forehead, chin, both cheeks and nose. Using palms of hands, smooth Rich Cream from inside face near nose outwards circling around eye area. Q1 Can Clay Wash remove makeup? We recommend washing QuSome NanoOff Cleansing to remove makeup covering the skin such as mineral and/or powder foundation. Q2 Sometimes the product manufacturer will recommended using a foam wash. So which is more gentle for the skin, foam wash or Clay Wash? Foamed facial cleansers contain many surfactants, which not only remove bacteria and dirt, but also remove the oil that is essential in the skin. Its removal disturbs the skin's natural turnover process and causes the skin to become dry and sensitive. By contrast, our Clay Wash does not use foaming ingredients. As a result, it leaves the essential moisture in the skin and therefore can be used on delicate skin. Q3 I heard that I might get acne after using Clay Wash. Is this true? Due to the nature of natural clay contained in our Clay Wash, dirt from deep in the back of pores and oxidized sebum are discharged to the surface of the skin. As a result, there might be times when you may temporarily have acne. However, with continued application of our Clay Wash, the acne will calm, so please watch the state of the skin for sometime before deciding to discontinue usage. However, if the condition persists, we recommend that you stop using it and consult a doctor. Q1 Are there any caveats for using C serum during the daytime? Please be sure to use with a sunscreen when you are using during the day. In addition, we recommend using a small amount on the area thought to be dry. Q2 I feel warm sensation when C Serum is applied. Does it mean its not suited for my skin? Although you may feel a warm sensation when applied to skin, it's the characteristic of C serum and should be no problem or damage if there is no redness or itching etc. Also, depending on the season, temperature, physical condition, you may not feel a warm sensation when applied so please feel assured that there will be no change in the effect. Q3 Which is more effective on dark spots, QuSome White Essence or C serum? C serum is a beauty serum that encourages skin turnover with a peeling action. QuSome White Essence is a protective essence that blocks UV damage. Please choose according your desired care. Q1 Can I use QuSome Retino A and QuSome White Cream 1.9 together? Q2 Why can't I use it during the day? QuSome White Cream 1.9 contains Hydroquinone, which is a useful compound that is easily effected by ultraviolet rays. This may cause irritation to the skin, so please use only at night. Q3 Can I use it on both my body and hands? Yes. It is safe to use on both. We recommend applying to the areas like the face because the photo-aging progresses more on sites where there are many opportunities for UV rays to hit. However, avoid using it on mucous membranes or thin parts of the skin when combining with other hydroquinones (contains cosmetic products may cause irritation and inflammation). 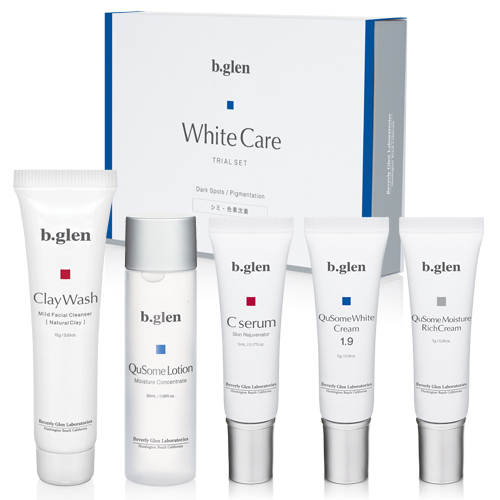 Q4 When using with QuSome White Cream 1.9, which is most effective C Serum or QuSome White Essence? C serum and QuSome White Essence both work differently, so it can not be said unconditionally which is more effective. C serum is a beauty serum that encourages skin turnover with a gentle peeling action. QuSome White Essence is a protective essence that blocks UV damage. Please choose according to your desired care. Q5 Is it possible to combine with a hydroquinone prescribed in my dermatologist? There is a risk that the total amount of hydroquinone in contact with the skin will rise when combined with prescriptions, so we recommend consulting with a doctor beforehand. Q6 Will it continue to be effective if used for a prolonged period of time? Yes. However, there are individual differences in the skin. When seasons change, if there is a tingling sensation or redness that has never occurred before, it may be a good idea to halt usage temporarily. When the condition of the skin returns, please resume using while closely observing the situation. Q7 Is it safe to use while pregnant? Yes, it can be used while pregnant. Generally, it has been said skin sensitivity (even to regularly used products) may change while pregnant and/or lactating due to a change in the woman's condition. Therefore, it's still okay to use. If you are concerned about using a new skincare product, we recommend consulting with a doctor in advance. Q1 Can I use it in the morning? Yes. Our QuSome Moisture Rich Gel is a highly functioning moisturizing cream that can be used both morning and night. Q2 When I started using QuSome Moisture Rich Cream, I began to get acne pimples. Is it safe to continue to use? There is no need to worry. The oil contained in our QuSome Moisture Rich Cream is formulated to make it difficult for acne to occur after its use and application. However, if you are still concerned after use, we recommend avoiding application on the acne prone areas.